Science is often depicted in opposition to the general public. As scientists we are interested in building bridges between both groups. Our project is about the genetic modification of human immune cells for a therapeutic usage. Therefore it is especially important to take into account the opinion and concerns of the community and local experts. The engagement elaborated key factors of the projects implementation in a real life scenario. As a first step, a survey was conducted, where people had the chance to share their opinion towards our project and immune-based therapies in general. Respondents were asked whether they consider immunotherapies worthy of support, how they would feel about beeing treated with such a therapy and which aspects would be most important to them. The majority would contemplate to undergo a therapy based on our approach in the case of cancer diagnosis. They consider research on immune-based cancer therapies important and worthy of support. Among efficacy, safety is regarded to be one of the most important aspects of our project. Detailed information about the survey can be found below. After a short introduction into the current status of CAR T cell therapies, and the improvement by our project, the participants were asked the following questions. 1. Do you consider research on immune based cancer therapy important and worthy of support? 2. In case of a cancer diagnosis: Would you consider undergoing a therapy based on our project, if clinical trials would have confirmed the security and compatibility? The cost of the treatment would be covered by the health insurance. Figure 1: Results of a small survey covering immunotherapy and our project. In total, 35 responses per question were collected. a) First two questions of this survey are about acceptance of immunotherapy and our project. b) Last question asking for aspects considered most important. The responses show, that the two most important aspects are efficiency and safety. Currently CAR T cell therapy development is challenged by overreaching efficacy rather than lack of potency, causing off-target effects. Since our project already aims to solve this issue we sought,inspired by these results, to address the second most frequent concern by improving safety aspects of the CARTELTM AND gate. We consulted experts to evaluate feasible safety implementations for our system. At the science fair and the science days we had plenty of opportunities to give the community an understanding of CAR T cell therapies and our project. People recognized our efforts in improving the safety and the compatibility of a novel cancer therapy. Yet, they were concerned by the prospect of introducing genetically modified immune cells to specifically target and destroy cancer tissue. In order to address these concerns we consulted the group of Prof. Dr. Toni Cathomen from the Center of Chronic Immunodeficiency (CCI). Being the director of the Institute for Transfusion Medicine and Gene Therapy in Freiburg, he is dedicated to research of the immune system and rare immune diseases. Based on this advice and contribution, we established a kill switch, which specifically eliminates our modified T cells in case of unexpected behaviour. To improve the safety of the CARTELTM T cells a kill switch, which specifically eliminates CAR T cells that cause unexpected side effects, was implemented. A not negligible risk may occur due to lentiviral transduction of T cells, as it can integrate constructs near an oncogene. This favors the formation of cancer within the population of modified T cells themselves. The switch is controlled by a drug, that does not affect unmodified cells in moderate doses. This approach is frequently used in clinical studies of modified lymphocytes. It is based on the drug ganciclovir (GCV) and its effector, a thymidine kinase commonly expressed by cells infected with herpesviruses (Bondanza et al., 2006). GCV is usually used as medication against human herpesviruses. It has a high affinity to viral kinases like the thymidine kinase expressed by infected cells. These kinases initiate metabolization of ganciclovir into a nucleotide analogue, which is subsequently integrated into the genome by the DNA polymerase. This results in disruption of DNA replication of proliferating cells leading to apoptosis (Fischer et al., 2005). Ganciclovir has a 1000-fold higher affinity to the herpes simplex virus 1 thymidine kinase (HSV-TK) than to native kinases and therefore exhibits excellent kinetics for a kill switch, as it leaves non-targeted cells unaffected (Dey & Evans, 2011). Figure 2: Schematic representation of the functional mechanism of ganciclovir. a) Structures of ganciclovir, guanine nucleotide and ganciclovir triphosphate. 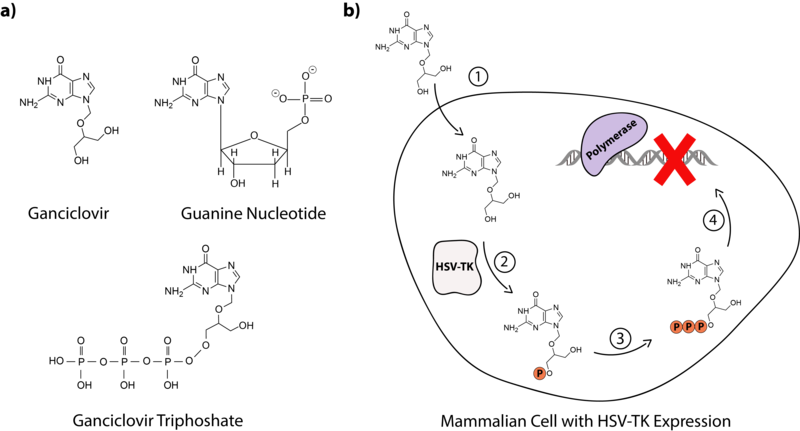 b) Ganciclovir enters the cell (1) and is phosphorylated by the expressed HSV-TK (2). Cellular thymidine kinases lead to two additional phosphorylations of ganciclovir (3). The ganciclovir-triphosphate is a guanine analogue which inhibits the cellular DNA synthesis processes (4). This leads to apoptosis. Based on the concerns of people and the advice of Prof. Dr. Cathomen to integrate an additional safety mechanism into our CAR T cells, we were able to introduce a drug based safety system. This will allow elimination of CARTELTM T cells in case of severe side effects and thus improve our system. Stable cell lines containing the suicide gene were established and used successfully to confirm its function. The experiment and the results are displayed in the results section. In order to learn more about safety aspects in CAR T cell therapy, we discussed our project with experts. The estimated cost for the first approved CAR T cell therapy manufactured and marketed by Novartis (Tisagenleucel) in the United States is about 475 000 $ for 1 year (Hagen, 2017), an amount not every health insurance is willing to cover. The therapy is approved specifically against pediatric acute lymphoblastic leukemia. CAR T cell treatments for solid tumors are still in clinical trials since they are difficult to implement due to severe off-target effects. Due to the early stage of research on this subject, we consulted experts about the prospects and future developments of CAR T cell therapy as an integral part of cancer therapies. We discussed how to make it suitable for the treatment of solid tumors, and how our CARTELTM system may impact this. Prof. Dr. Cathomen informed us about possibilities for optimization and automation of manufacturing protocols. This is a critical step to make CAR T cell therapy affordable and ready to use at every treatment center. Additionally he was enthusiastic about possible future applications of the CARTELTM system. For the full interview see the dropdown below. iGEM Freiburg: The newly approved CAR T cell therapy from Novartis costs 475 000 $. Is there a possibility of reducing these costs for example by using allogeneic T cells? Prof. Cathomen: Allogeneic T cell therapy is already used in clinical trials. The procedure for this is as follows: The endogenous T cell receptor, which is responsible for allogenicity, is knocked out. This approach is combined with a very strong chemotherapy, eliminating the immune system and its blood stem cells. Afterwards, new stem cells along with CAR T cells are transplanted into the patient. The allogeneic T cells are present in the patient until the immune system is replenished by the engrafted stem cells. The CAR T cells are then eliminated by the newly developed immune cells. This means that the price will decrease as T cells can be produced in advance and can be derived from a healthy donor, enhancing the reproducibility of the whole process. The drawback, however, is that the T cells are only available for a limited timeframe of about twelve weeks before they are eliminated by the immune system. A clinical trial has already been published. It was successfully conducted on two children suffering from a type of T cell leukemia in London. The patients received a stem cell transplant along with allogeneic CAR T cells targeted against CD19 . Both patients were terminally diseased with no conventional therapies being available and both of them survived. This principally shows that the concept works. iGEM Freiburg: Could this also be used against solid tumors? Or does that require more time? Prof. Cathomen: Carl June (a pioneer of CAR T cell therapy) says that to prevent relapses it might be important to have memory CAR T cells. This is where the problem with “off-the-shelf CAR T cells” lies, which are completely eliminated. This raises the question if the tumor might reappear. This has not been answered yet. In solid tumors, a difficulty lies in the tumor microenvironment that develops some specific characteristics that limits the access of T cells and also CAR T cells to the tumor. We try to overcome this via a knockout of checkpoint inhibitors such as PD-1 (programmed cell death protein 1). If this approach is applicable has not been shown yet. There are many ongoing studies working in this field, but no data has been reported until now. iGEM Freiburg: So the CAR T cell therapy cannot be applied without previously switching off the immune system? Prof. Cathomen: I would not put it that way. In the case of allogeneic CAR T cells it is a must. Whether this approach is desirable for solid tumors is a different question. I would be more critical about this because the whole immune system needs to be eliminated. In the case of leukemia this is the desired effect chemotherapy. The situation is, however, completely different for solid tumors. The tumor cells cannot be completely eliminated with chemotherapy. iGEM Freiburg: So allogeneic T cells are no option in fighting solid tumors? Prof. Cathomen: It is not impossible but very difficult. The CAR T cells have to be modified, as not to be recognized by the immune system. By this modification, however, you endow the CAR T cells with the potential of developing into a tumor. You can equip CAR T cells with a safety switch such as TK (thymidine kinase), so you can eliminate them. But as tumor cells divide rapidly they accumulate a lot of mutations, and it has been shown that TK can lose its function due to mutations. Then these T cells cannot be killed anymore. This is a common problem in cancer treatment. 99.9 % of cells might be killed by a certain treatment, but the surviving 0.1 % of cells are resistant to all therapies previously used. They are positively selected. iGEM Freiburg: Do you think that our approach of using the tumor microenvironment could contribute to this therapy? Prof. Cathomen: I do find this idea very interesting. The CAR T cell being only active in the milieu created by the tumor. This could be possible, but still has to be tested in a mouse model, first. You would have to induce the formation of tumors in mice where such a micro milieu is formed. In this model, it could be tested whether the CAR T cells are activated and attack the tumor. Finding the right tumor model would be the next important step in this context. Because mouse models are usually based on xenografts, meaning that human tumor cells and human CAR T cells are transplanted into mice. This model is of course very artificial. The tumors grow, for example, much faster than in the natural human background. If the tumor grows too fast, the mouse has to be killed due to ethical reasons. So, creating the right mouse tumor model is always quite tricky. iGEM Freiburg: Can you think of other factors defining the tumor microenvironment? Prof. Cathomen: This is very specific for the type of tumor. The inputs you want to apply are very well chosen as they are pretty common for the most types of cancer. VEGF is necessary to stimulate tumor growth and hypoxia is also very common. The next level of specificity is achieved via the CAR. For prostate cancer, you could for example choose PSMA (prostate-specific membrane antigen) as a target. This antigen is enriched in the tumor, but it also exists in healthy tissue, for example the brain. The concentration of PSMA in the brain is far lower compared to the tumor. If a CAR T cell, however, reaches the brain and encounters its antigen severe problems could arise. iGEM Freiburg: This would be the situation in which CARTEL could be beneficial? Prof. Cathomen: Yes, in this situation your system is very interesting. The CAR is only expressed in a certain microenvironment and is further restricted by its specificity for the desired antigen. So, the concept is pretty good and interesting. iGEM Freiburg: Back to allogeneic T cells. Do you think there is a possibility of using them for the treatment of solid tumors? Prof. Cathomen: As I said before: For leukemia, the chances are pretty good that the concept will work out. A possibility for solid tumor could be the intratumoral application of allogeneic CAR T cells. But again: If the immune system cannot be easily eliminated – and this is the situation in solid tumors – allogeneic T cells have a low chance of survival. iGEM Freiburg: A different problem is that metastases present different antigens than the primary tumor. Is there a chance for CAR T cell therapy to also eliminate metastases? Prof. Cathomen: I do not think that CAR T cell therapy can ever be used as a single means, but has to be used in combination with other treatments such as kinase inhibitors, antibody based therapies, chemotherapy or surgery etc. I think it will always be a combinatorial therapy. Currently, CAR T cells are used as the ultima ratio. In the future, this will maybe change, if clinical trials confirm that CAR T cells become safer. For sure the therapy has a huge success, but fatal off-target effects are observed every now and then, so the risk has to be considered. We are talking about patients with a low chance of surviving the next two or three month. In these cases the risk is acceptable. In other cases, survival rates are higher, so one is going to be more reluctant in choosing relatively risky therapies. iGEM Freiburg: So there are still no clinical trials on patients with early stage cancers? Prof. Cathomen: No, this is at the moment not approved. Patients really have to be terminally diseased. CAR T cell therapy still is the ultima ratio. iGEM Freiburg: Could this change in future? Prof. Cathomen: I think so. At the moment, there are a lot of clinical trials concerning CAR T cells of the first generation. They do not yet include any safety aspects. Again, if this aspect of the therapy is further developed, CAR T cells could become more feasible for treating early stage cancers. For example, by introducing safety features to eliminate cells, via TK for example, or to use synthetic switches which allows us to switch them on and off again. In your case, this switch would be triggered by the microenvironment. But there are also other possibilities with which the CAR T cells can be externally switched on and off. If an overreaction of the immune system is observed CAR T cells could be inactivated and reactivated again after the symptoms have declined. Once CAR T cells have become safer, they will be used more commonly. This would really be meaningful in the context of metastases. iGEM Freiburg: What are the potential long term consequences of CAR T cell therapy? Prof. Cathomen: The only CAR of which we have sufficient data is directed against CD19. These CAR T cells persist in the patient. It was initially expected that these cells would disappear after some time, but apparently, memory T cells have been transduced with the CAR along with effector T cells and these memory cells persist for decades or even lifelong. This means that every B cell in the patient will be eliminated after the treatment. So, these patients will always lack B cells and never be able to produce antibodies anymore. This trade-off is less tragic as it seems as the patients have survived the tumor and the immune system can be stabilized by regularly injecting immunoglobulins, a mix of different antibodies. iGEM Freiburg: But this would also mean that memory CARTEL T cells will also be able to fight the tumor if it reappears? Prof. Cathomen: Right, your approach is really predestined for solid tumors, but not for leukemia. iGEM Freiburg: Recently a therapy from Novartis against B-cell ALL was approved by the FDA. Can you imagine when the first therapy like this will be approved in Europe? Prof. Cathomen: This is a somewhat difficult question, but I think that we will see an approval for a CAR T cell therapy next year or maybe one year later. The market is also present in Europe. But Novartis has to construct the infrastructure first. The concept of Novartis is centralized production in huge clean rooms. The isolated T cells have to be shipped to these centers for modification and afterwards back to the hospital for transplantation. The manufacturing process still has to be approved, but Novartis certainly has a big interest of an approval of this therapy in Europe. iGEM Freiburg: The key to future centralized manufacturing? Prof. Cathomen: Novartis (and other CAR T cell companies favor centralized manufacturing. I do not think that this is where we are heading in the future. I think that automation of the manufacturing processes will be the future, meaning that every clinic will be able to produce its own CAR T cells in an automated process. There is a German company, for example, that is about to produce such machines: you basically supply the device with the patient’s T cells and the desired CAR vector and after three weeks you end up with the ready to use CAR T cell product. This product, prepared on site can then be used directly to treat the patient. This is making the logistic process a lot easier, as you do not have to ship everything to one central location. Personally, I think that an automated local production is the way to go for the future. iGEM Freiburg: But this is still some time ahead? Prof. Cathomen: Well, these devices already exist. 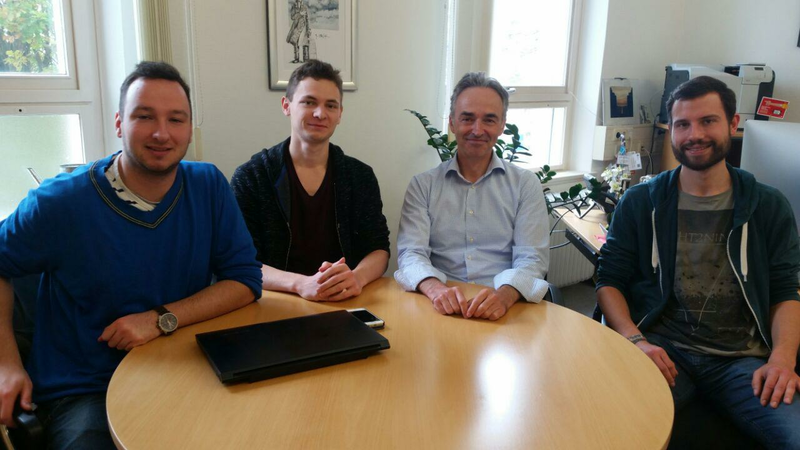 iGEM Freiburg: Thank you very much for taking some time to discuss this project with us! PD Dr. Simone Hettmer from the Comprehensive Cancer Centre Freiburg, is a practicing pediatric hematologist and oncologist, and shared her insights on how children with cancer and their parents perceive novel treatments. As one of 13 oncology centers of excellence in Germany we asked about her opinion concerning our project. When we asked about the possible acceptance of our CARTELTM system by future patients, she raised awareness for the individual situation of each future patient. 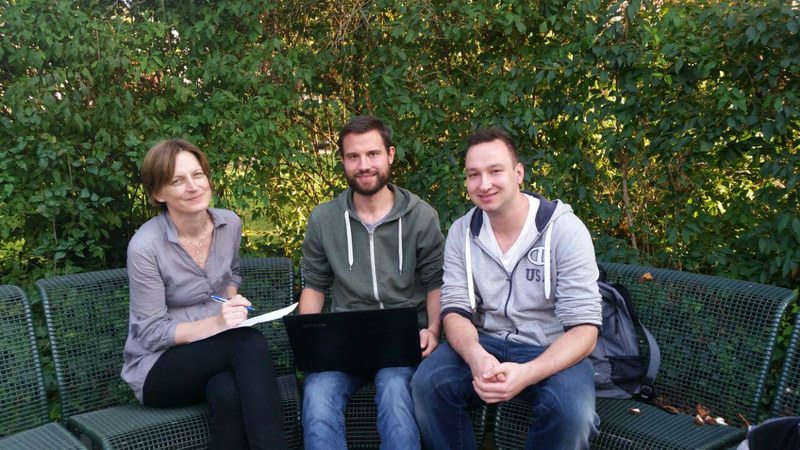 iGEM Freiburg: Dear PD Dr. Simone Hettmer, thank you for having this interview with us. First of all, how do you like our approach to this project? PD Dr. Simone Hettmer: I think that your approach to CAR T cell therapies is very promising. I especially like that you prioritize the importance of the tumor microenvironment. At the moment, little is known about how tumor cells influence their niche and how healthy cells in their niche interact with neighbouring tumor cells. iGEM Freiburg: Our project is not the universal solution to fight cancer, but we think it can contribute to the establishment of CAR T cell therapies against solid tumors. What obstacles do you see in our project or CAR T cell therapies in general? PD Dr. Simone Hettmer: The key to developing a successful CAR T cell therapy is to identify a common antigen, that is expressed on all cells of an individual’s tumor, such as CD19 in B-lineage leukemias or CD30 in Hodgkin’s lymphoma. In case of a solid tumor, that includes the primary or relapsed tumor’s progeny at distant metastatic sites, too. At the same time, the antigen must not be expressed on other functionally relevant cells, in order to limit toxicity by off-target effects on healthy cells. There are practical issues as well. You need to be able to extract a sufficient number of functional T cells from the patient in order to be able to make CAR T cells to treat that particular patient’s tumor. Also, if you use lentiviruses to engineer cells, you need to very carefully control for off-target effects of lentiviral transduction that may promote malignant transformation after reinfusion into the patient. iGEM Freiburg: Would people accept a project like ours which is based on genetic modification of immune cells? PD Dr. Simone Hettmer: Well, you need to convince the medical community as well as the patients. For the latter, you need to provide sound safety and efficacy data in vitro and in preclinical animal studies, and initiate well-controlled clinical trials to prove that your approach is actually safe and effective in real patients. If well-established and highly successful treatments are available (as is the case for several pediatric cancers), you may also have to show that your treatment is better than what’s already sitting on the shelf. As far as patients and families are concerned, I believe that acceptance depends mostly on cultural and personal factors. Some families are very concerned about being part of an “experiment”. Others prioritize the quality of life at home at the end of life over hospital stays, logistical strains and side effects that may be associated with an experimental treatment. Still, losing a child is the worst thing that can happen to any parent, and most families are desperate to find a cure for their sick child. PD Dr. Simone Hettmer: That’s not quite true… certain side effects are well-known, for example Cytokine Release Syndrome, which indicates a fulminant response to immune treatments. Other side effects will come to light as more and more patients undergo CAR T cell therapy. This is especially true for late effects of treatment, an important consideration for children, who may go on to live for decades after their cancer is cured. iGEM Freiburg: Thank you very much for your time and your expertise! PD Dr. Simone Hettmer: You’re welcome.